This book which traces the industry from the 17th century until it was subsumed by modernity in the 20th century, is intended not to just chronicle, but also pay tribute to a rather special sort of people now sadly vanishing from living memory. A retired engineer who for many years was a guest tutor at the Snowdonia National Park Environmental Studies Centre, Plas Tan y Bwlch and sometime lecturer at Coleg Harlech Summer Schools. A native of Swansea he is a past Chairman of the South West Wales Industrial Archaeology Society and of the Swansea Art Society. 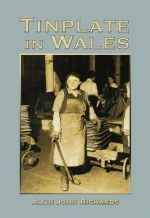 Although his speciality is the Welsh slate industry on which he is an acknowledged expert, he also writes and lectures on a variety of aspects of industrial history. He is also a vigorous defender of the landscape and environment of Wales. For almost three centuries Welsh tinplate cased, cannistered, roofed, housed and even embellished the world. In every country and clime from pole to pole, it enabled cities to be fed, new territories to be found and founded, wars to be won and peace enjoyed. Welsh tinplate created communities, it created towns, it created an ethos where men and women, seemingly forged in their own furnace fires, walked tall in a unique pride of product.